At the end of the summer, we celebrated my daughter’s eighth birthday party. She wanted a pool party and then she decided on a rainbow pool party. She loves to help plan and create things in the party. She also had a definite vision of what she wanted her cake to look like and she LOVED the outcome! In Texas, if you have an outdoor party in August, then a pool party is a must. Well, this was one of those crazy days that you don’t expect because that one day, it ended up cloudy, windy and rainy. This made me change the set up of the party from outside to inside then back to outside. Therefore, my decorations didn’t go quite as planned but the most important thing was that it was nice during the party and the kids were able to swim which is exactly what my daughter wanted! I designed the invitation with a beach ball and rainbow to fit the theme. The invitation opened in a similar way to my Candy Land invitation. I was fortunate to come across free rainbow printables from Printabelle that were featured on Catch My Party. I used the printables for the food labels and party favors. I had rainbow food that coordinated with a pool theme. 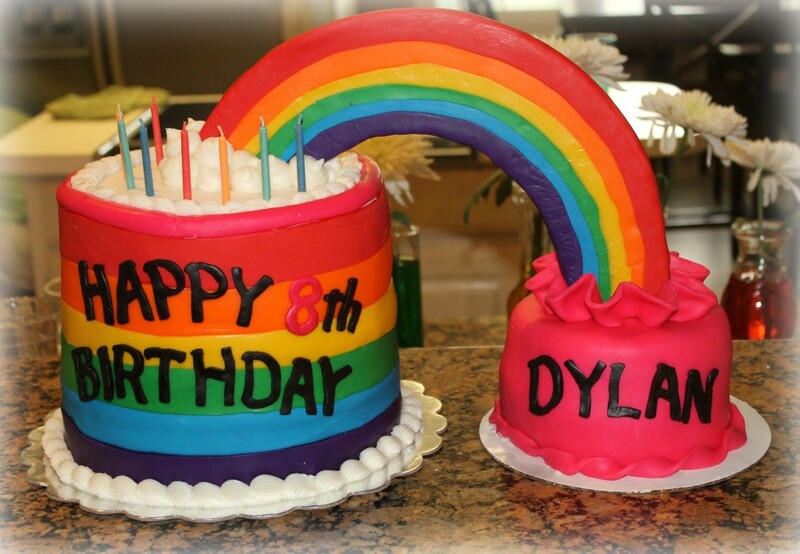 The kids favorite treat were the rainbow slushies that was served with the cake. Of course the kids also always love the pinata filled with fun treats! The balloon arch was a vision that I had one afternoon before the party and I was so glad that my husband and dad helped create this! The best thing by far about this party is the excitement that I see in my daughter’s eyes and smile! Hi! I got pointed to your site from a friend of mine who saw that you had used my printables at your party. I loe all the fun things you did with them, that was so great how you had the beach balls, clouds and life savers! I love it! Please let me know if it would be okay with you if I featured your party on my website? What a fun party for Miss Dylan! You did an outstanding job, as always. I love how the vases on the counter tie into the rainbow cake. Great party.